Grasshopper Jim Whitney once threw 57 complete games in a season. Here’s a list of statistical categories Grasshopper Jim Whitney led the majors in during his rookie season: wins (31), losses (33), games pitched (66), games started (63), complete games (57), innings pitched (552 1/3), hits allowed (548), walks (90), wild pitches (46) and batters faced (2,301). Oh, and he also played 15 games in the outfield, plus two at first base. He was born James Evans Whitney in 1857 in Conklin, N.Y., about 10 miles down the Susquehanna River from Binghamton, where he died 33 years later. Whitney made his National League debut with the Boston Red Stockings in 1881 and pitched five seasons for the club. His rookie year stat line was staggering, but his third season was his best. 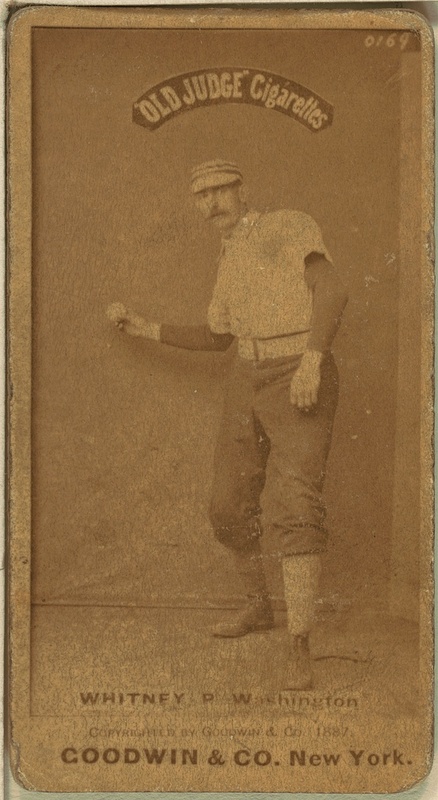 Whitney went 37–21 with a 2.24 ERA in 1883 and set an NL record with 345 strikeouts. That was also the season when he pitched three games of a crucial four-game September series against Chicago, jumping over the White Stockings in the standings to seize the pennant. That article also raises questions about Whitney’s death. “It generally has been supposed that he died of consumption,” the article reads, but former opponent Al Maul offers another explanation. Maul might be right. Assuming Maul witnessed the incident, it must have occurred in 1888 (the only year Whitney played for Washington and Maul and Kuehne both played for Pittsburgh). Whitney did pitch in 1889 and 1890 but he was ineffective, with a 6.22 ERA and 1.791 WHIP. He died on May 21, 1891 at age 33.